It was undoubtedly the concert of the year for those of us in the Pacific Northwest. Even if we’d seen Slayer 10 times, we still bought the ticket for this “last tour.” While none of us believe it will actually be the case (they’ll return in a year or two because this is what they know), if they do retire, they can stand proudly on the merits of this colossal performance. With a band selection that rivals any memorable summer festival, this dream thrash metal extravaganza did not disappoint. Exactly on time at 5:00 P.M., Napalm Death took the stage. 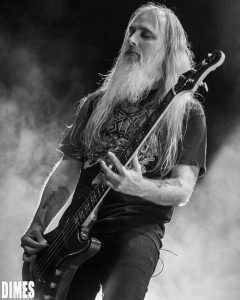 Their aggressive metal was met with fans screaming “Slayer,” whenever there was a break in the onslaught of sound. A good choice for the opener, although the venue wasn’t even 25% full. Likely because it was a Thursday night, and there were those of us who work during the day…and that nasty Portland/Vancouver rush hour traffic. The very cool thing about this lineup was that people actually wore their old tour shirts from this lineup of bands. Generally taboo (and I absolutely don’t understand this unwritten “law” of metal), fans wore their Slayer, Testament, Napalm Death, Anthrax, and Lamb of God Shirts proudly. Testament was in the second position, and if you removed Slayer from the mix, they absolutely stole the show. Being a fan of every band in this lineup, the only shirt I was missing was Napalm Death, and the decision on which to wear was excruciating. I settled on Testament, and wasn’t sorry. There was nothing new in this solid performance; Chuck Billy played the mic stand as he normally does, and the rest of Testament did their job incredibly well. When I say “nothing new,” it’s meant as a term of endearment, because there isn’t any enhancement on earth that would make Testament any better. If something is perfect, let it be. 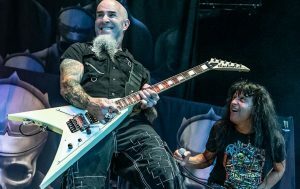 Scott Ian and his band of merry men stepped onto the massive stage and the crowd finally stopped yelling “Slayer” for a moment. Playing a wide range of songs from their catalog, they sounded better than ever. It’s almost like we revere Ian as a super hero; I couldn’t take my eyes off him and his antics. Anthrax never disappoints. Belladonna ran the stage like a teenager and was inspiring to watch. Whether you are team John or Joey, you’ll always love Anthrax. always charismatic Randy Blythe was in fit form, jumping off things that he probably shouldn’t. While they weren’t spectacular on this night (they were a little low energy), they proved why they deserved to be on this bill, and be direct support for Slayer. It was here where we ran into some celebrities; members from The Athiarchists, Deftones, and Danger Aaron of Jackass fame. As the sun set, everyone was in their seats. The chants of “Slay…er,” “Slay…er,” were defining. The lights went out and BOOM, Slayer took the stage. Playing songs from their catalogue, it’s a shame to see them quit touring. I’m sure touring for 40 years is likely enough both in mind and body, but we haven’t had enough of them; not by a long shot. From the stories of the graciousness of the band during the meet and greet, to the hidden drum sticks by drummer Paul Bostaph, Slayer will stay on top as the kings of thrash metal. I guess it’s better to go out on your own terms…I guess time will tell.